GDDR4 Memory Model provides an smart way to verify the GDDR4 component of a SOC or a ASIC. 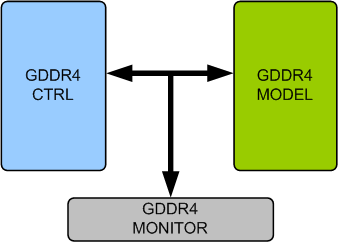 The SmartDV's GDDR4 memory model is fully compliant with standard GDDR4 Specification and provides the following features. Better than Denali Memory Models. Supports GDDR4 memory devices from all leading vendors. Supports 100% of GDDR4 protocol standard GDDR4Spec_rev_04. Supports all the GDDR4 commands as per the specs. Quickly validates the implementation of the GDDR4 standard GDDR4Spec_rev_04. Supports for programmable clock frequency of operation. Supports for all types of timing and protocol violation detection. Supports for all mode registers programming. Supports for Double data rate architecture. Supports for Single ended READ strobe (RDQS) per byte. Supports for Single ended WRITE strobe (WDQS) per byte. Supports for Quad or eight internal banks for concurrent operation. Supports for Programmable Burst Length 8. Supports for Data mask (DM) for masking WRITE data. Supports for Auto Precharge option for each burst access. Supports for Auto Refresh and Self Refresh Modes. Supports for On‐die termination (ODT). Supports for Programmable offset for both driver and termination. Supports for Parity and Boundary Scan. Supports for input clock stop and frequency change. Notifies the test bench of significant events such as transactions, warnings, timing and protocol violations. Protocol checker fully compliant with GDDR4Spec_rev_04. Constantly monitors GDDR4 behavior during simulation. Supports Callbacks, so that user can access the data observed by monitor. Faster testbench development and more complete verification of GDDR4 designs. Easy to use command interface simplifies monitor control and configuration. SmartDV's GDDR4 Verification env contains following. Complete regression suite containing all the GDDR4 testcases. Examples showing how to connect and usage of Model.